This weapon was originally going to be a [[Glock 17]], but for some reason Rockstar forgot to render it as such. However, the Glock 17 can be seen in numerous cut scenes. Instead they left in the old [[M1911A1]] render from ''[[Grand Theft Auto III]]'' and ''[[Grand Theft Auto: Vice City|Vice City]]''. Called the "9mm" it is used by all members of the San Andreas Law Enforcement community and by many criminals ingame. Unrealistically, this weapon carries 17 rounds in a magazine (like the Glock it was supposed to be), and isn't very powerful. 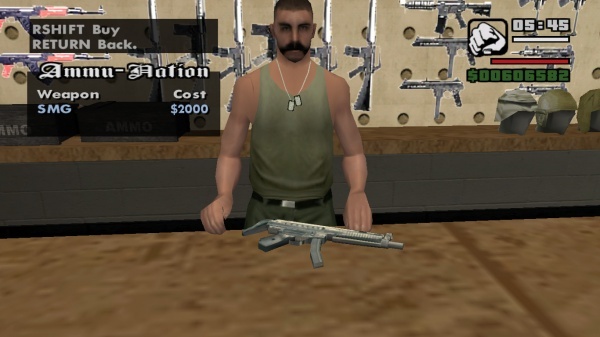 When the player reaches the "Hitman" skill level, CJ can wield two of these pistols at once (as does every AmmuNation vendor should the player decide to provoke him). 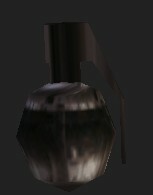 A suppressed version is also available for use in the game. It does more damage but uses a different ammunition type than the regular "9mm" and cannot be dual-wielded. This weapon was originally going to be a [[Glock 17]], but for some reason Rockstar forgot to render it as such. However, the Glock 17 can be seen in numerous cut scenes. Instead they left in the old [[M1911A1]] render from ''[[Grand Theft Auto III]]'' and ''[[Grand Theft Auto: Vice City|Vice City]]''. 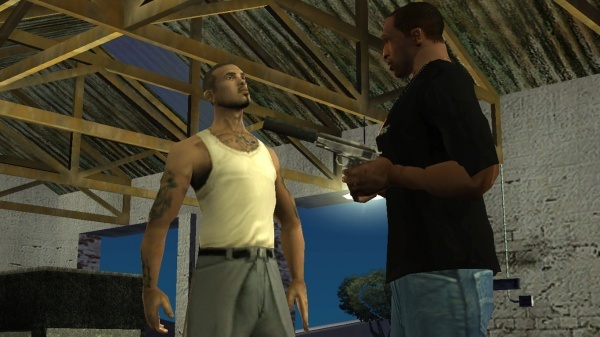 Called the "9mm" it is used by all members of the San Andreas Law Enforcement community and by many criminals in-game. Unrealistically, this weapon carries 17 rounds in a magazine (like the Glock it was supposed to be), and isn't very powerful. When the player reaches the "Hitman" skill level, CJ can wield two of these pistols at once (as does every AmmuNation vendor should the player decide to provoke him). 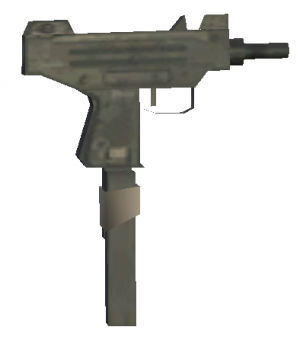 A suppressed version is also available for use in the game. 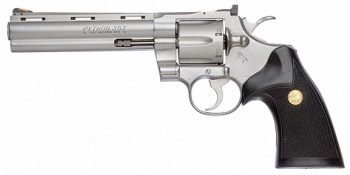 It does more damage but uses a different ammunition type than the regular "9mm" and cannot be dual-wielded. Ingame AmmuNation gun stores sell the standard M1911A1 and/or 30 rounds for $200, while the suppressed M1911A1 retails at a much pricier $600 for either the suppressed handgun and/or 30 rounds, possibly making this game title the first where a handgun's suppressor is worth more than the handgun itself. The standard M1911A1 becomes available at AmmuNation after the ''Doberman'' mission, while the suppressed version also requires that the ''Gray Imports'' mission be completed. Ingame AmmuNation gun stores sell the standard M1911A1 and/or 30 rounds for $200, while the suppressed M1911A1 retails at a much pricier $600 for either the suppressed handgun and/or 30 rounds, possibly making this game title the first where a handgun's suppressor is worth more than the handgun itself. The standard M1911A1 becomes available at Ammu-Nation after the ''Doberman'' mission, while the suppressed version also requires that the ''Gray Imports'' mission be completed. 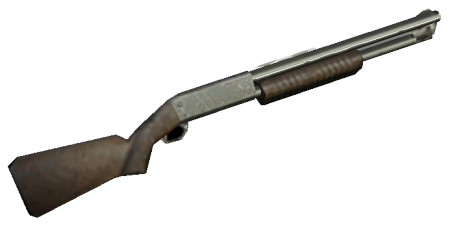 Simply called the "Shotgun" ingame, the [[Ithaca 37]] makes a return from ''[[Grand Theft Auto: Vice City]]'' and is the basic shotgun carried by some cops and many gang members and enemies in the game. CJ and Catalina each use one of these weapons during the ''Small Town Bank'' mission. Simply called the "Shotgun" ingame, the [[Ithaca 37]] with shorter barrel makes a return from ''[[Grand Theft Auto: Vice City]]'' and is the basic shotgun carried by some cops and many gang members and enemies in the game. CJ and Catalina each use one of these weapons during the ''Small Town Bank'' mission. As with other pump-action shotguns in the 3D universe of GTA games, the Ithaca 37 is treated as being single-shot, with the pump animation counting as a reload animation, which means CJ never loads new shells into the tube magazine (likely due to engine limitations carried over from ''[[Grand Theft Auto III]]''). As is typical for this firearm type in video games, the Ithaca 37 has a slow rate of fire, but is fairly effective at close quarters. The Ithaca 37 is also incorrectly depicted as ejecting a spent shell as it fires rather than after it's pumped, due to the pumping animation being treated by the game engine as a reload animation. The Ithaca 37 can be purchased at AmmuNation for a base price of $600, for the shotgun and/or 15 shells, and is unlocked for purchase there after completion of the ''Doberman'' mission. This shotgun becomes available for purchase at AmmuNation gun stores at a base price of $800 for the gun and/or 12 shells, and requires that both the ''Doberman'' and ''Just Business'' missions be completed to be unlocked. '''Note:''' All weapons in this category can be used one-handed in a drive-by shooting. 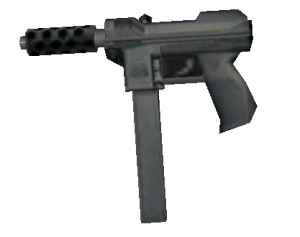 The TEC-9 and the Micro Uzi are categorized ingame as "Micro SMGs" when in reality they would be classified as machine pistols. They are treated as being generally inaccurate and relying on volume of fire to hit targets in this game. '''Note:''' All weapons in this category can be used one-handed in a drive-by shooting. 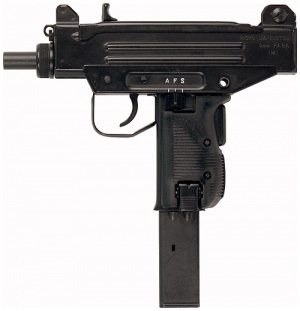 The TEC-9 and the Micro Uzi are categorized in-game as "Micro SMGs" when in reality they would be classified as machine pistols. They are treated as being generally inaccurate and relying on volume of fire to hit targets in this game. 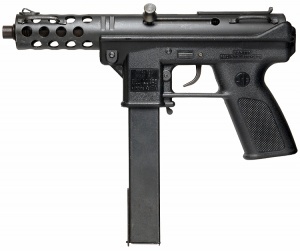 The HK94A3 retails for a base price of $2000 for the gun and/or 90 rounds of ammunition, and requires that both the ''Doberman'' and ''Robbing Uncle Sam'' missions be completed before becoming available for purchase at AmmuNation gun stores. The gun is also unique in that it is the only firearm with its own unique sales category, that being "SMGs." The [[Norinco Type 56]] appears as the "AK47," with its true identity evidenced by its hooded front sight (which differs from that of the [[AK-47]]/[[AKM]]). It is uncommonly used by gang members in the game. A rusty old one is also used by CJ during a first-person rail-shooting segment in the ''Reuniting the Families'' mission. Sweet also uses it in two of the missions. Due to the fact that the Type 56 uses the same reload animation as the Colt Model 733, CJ is shown to pull a nonexistent charging handle along the top of the weapon (when in fact the handle is on the real-life weapon's right side). On a side note, the Type 56 is unrealistically depicted as being 2/3rds long as CJ is tall, and also for some reason does only slightly more damage than the ingame HK94A3, which is an SMG rather than an assault rifle. The [[Norinco Type 56]] appears as the "AK47", with its true identity evidenced by its hooded front sight (which differs from that of the [[AK-47]]/[[AKM]]). It is uncommonly used by gang members in the game. A rusty old one is also used by CJ during a first-person rail-shooting segment in the ''Reuniting the Families'' mission. Sweet also uses it in two of the missions. Due to the fact that the Type 56 uses the same reload animation as the Colt Model 733, CJ is shown to pull a nonexistent charging handle along the top of the weapon (when in fact the handle is on the real-life weapon's right side). On a side note, the Type 56 is unrealistically depicted as being 2/3rds long as CJ is tall, and also for some reason does only slightly more damage than the ingame HK94A3, which is an SMG rather than an assault rifle. The Norinco Type 56 can be bought for a base price of $3500 for the gun and/or 120 rounds of ammunition. Completion of the ''Lure'' mission is needed to unlock it for purchase at AmmuNation gun stores. 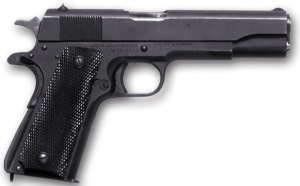 The Colt Model 733 can be purchased for a base price of $4500 for the gun and/or 150 rounds of ammunition, and is unlocked for purchase at AmmuNation gun stores after the ''Yay-Ka-Boom-Boom'' mission is completed. The [[Remington 700]] is simply called "Sniper Rifle" in the game, does nearly twice as much damage as the Marlin Model 336, and has an actual sniper scope. The Remington 700 retails for a shocking base price of $5000 for the gun itself and/or 10 rounds of ammunition, making it the most expensive firearm in the game. 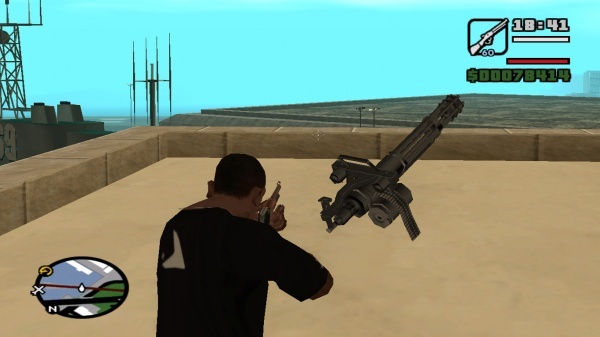 It is first given to CJ so he can cover allies with sniper fire during the mission ''Pier 69'', and also becomes available for purchase at AmmuNation gun stores after completing that same mission. 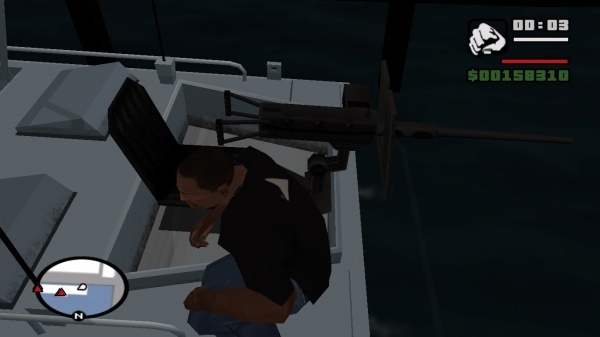 The most powerful weapon in the game, this weapon is used 3 times by CJ - First when protecting Zero's ([[David Cross]]) store from Berkley's planes, again while attacking the container ship in San Fierro Bay, and then again to take out two National Guard Hunter Helicopters in the "Up, Up, and Away" level. It can also be found in Mike Toreno's ([[James Woods]]) ranch house after the mission "Vertical Bird". 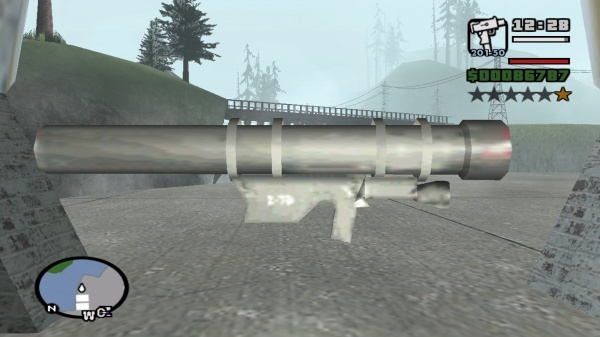 Called the "Heat Seeking Rocket Launcher" in the game, this weapon can lock onto enemy vehicles (including, strangely, pedal bicycles), making this weapon more effective than the Rocket Launcher at shooting down helicopters. It resembles an [[SA-7 Grail]]. A fictional handheld flamethrower that scorches anyone in front of it. It has a short range and can carry a maximum of 300 "units" of napalm with 50 "units" per "magazine," but has no reload animation, implying that the developers forgot to make the weapon use a single ammunition pool instead. 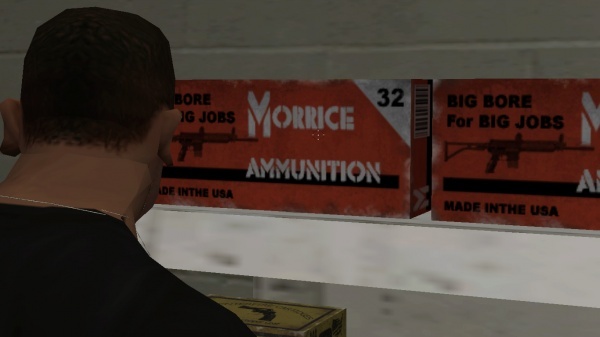 The flamethrower's first and most memorable appearance is in the mission ''Are You Going to San Fierro?'' where CJ must help the Truth, a hippie conspiracy theorist, burn down his marijuana fields to destroy evidence, but doing so makes Carl intoxicated by inhaling the smoke from the burning marijuana plants. 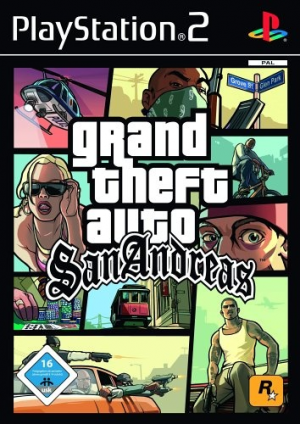 ''San Andreas'', like ''Vice City'', features a version of the Hughes AH-64 Apache, known as the "Hunter." 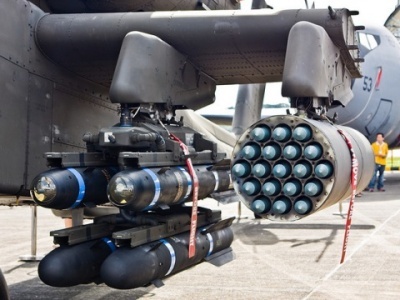 It has an M230 chain gun in a chin mount, and wing mounts containing eight AGM-114 Hellfire missiles in two packs of four, as well as two non-functional Hydra 70 rocket pods. 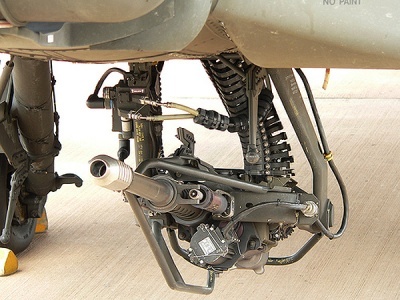 It is used in a few missions during flying school. When all flying school missions are completed with gold medals, the Hunter spawns at Verdant Meadows Airfield and inside Easter Basin Naval Station. You can also use this for vigilante missions, although these missions are called "Brown Thunder" instead (a spoof on the film, ''[[Blue Thunder]]''). Not an in-game weapon, but the 1st generation [[Glock 17]] is seen in a few cutscenes from the movie "The Introduction" (a movie released shortly after the game, to explain what happened before CJ came back to Los Santos). It is used by Salvatore Leone ([[Frank Vincent]]) to threaten Ken Rosenberg ([[William Fichtner]]) and Officer Jimmy Hernandez to kill Officer Ralph Pendelbury. 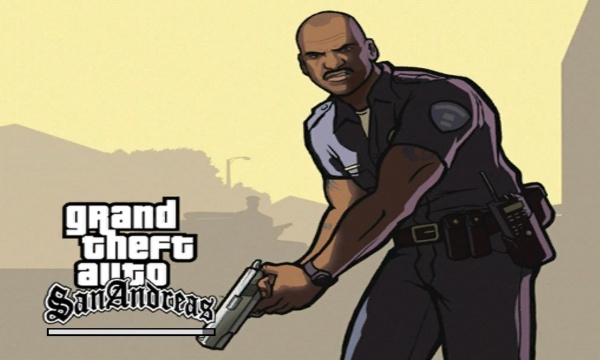 In the actual game, it is used by Officers Hernandez and Eddie Pulaski in the beginning cutscene of the game, by Mike Toreno when he first meets CJ, by CJ himself in the ''Home Coming'' mission, and by CJ, Sweet and Cesar in the final cutscene of the game. 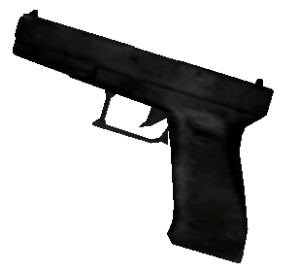 Not an in-game weapon, but the 1st generation [[Glock 17]] is used in various cutscenes, including but not limited to the beginning cutscene of the game and the the ending cutscene of the final mission. 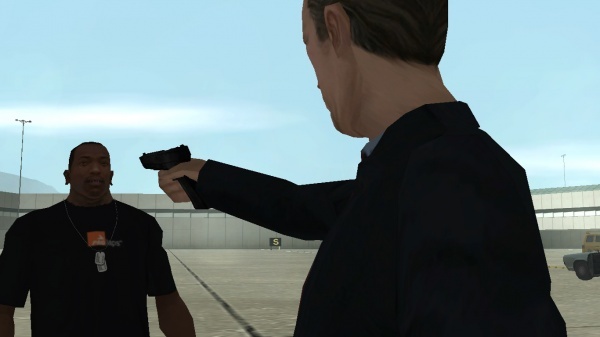 It is also seen in "The Introduction" (a short film using the game's engine, explaining what happened before CJ came back to Los Santos), where it is used by CJ himself to rob a pedestrian in Liberty City, by Salvatore Leone ([[Frank Vincent]]) to threaten Ken Rosenberg ([[William Fichtner]]), and by Officer Jimmy Hernandez to kill Officer Ralph Pendelbury on the orders of Tenpenny. 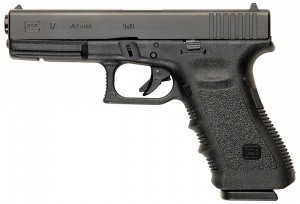 Of note is that the real Glock 17 uses a 17-round Magazine. The Glock's existence in certain cutscenes may explain why the M1911 skinned '9mm Pistols' in the game have an unrealistic magazine capacity, as the game skins were changed from a Glock to an M1911 during development but the magazine capacity remained the same, as did some of the skins in certain cutscenes. 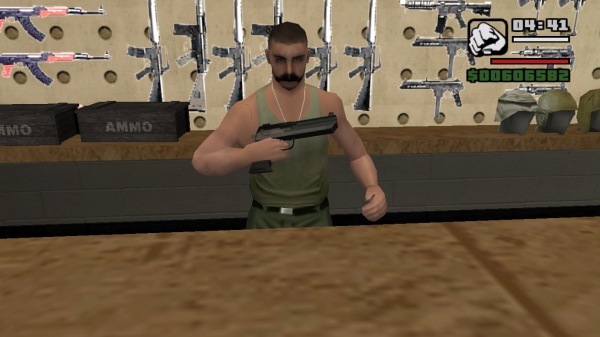 The player can use the Glock if he modifies the game's files. While the Glock is modeled on the earlier 1st and 2nd Generation models, the texture is taken from a 3rd Generation model as the thumb reliefs are visible. A similar error is also later found in [[Grand Theft Auto IV]] where the Pistol is based on a Glock 17 with 17 rounds of 9mm ammo, but has the texture of a Glock 22. 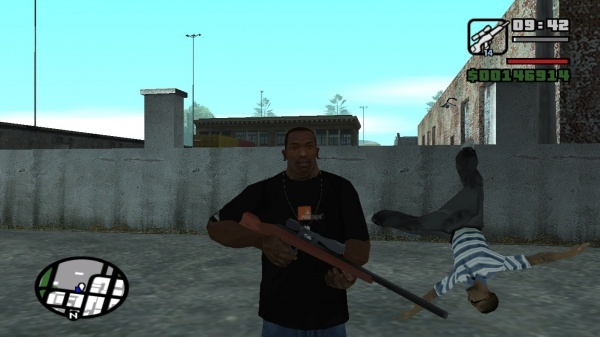 In the final mission, "End of the Line", A statue of Big Smoke can be seen holding a shotgun and the [[Uzi]] submachine gun. 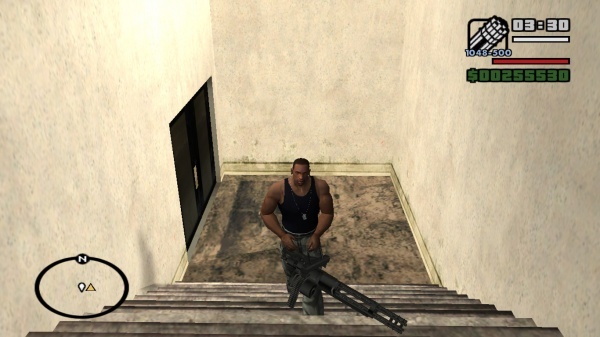 The Uzi was replaced before its release along with the early appearance for Big Smoke. One of the loading screens shows Tenpenny armed with what appears to be a [[Springfield Armory Mil-Spec M1911A1]]. 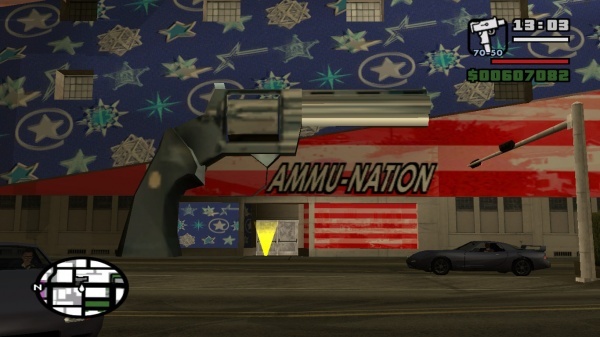 The [[Colt Python]] from ''[[Grand Theft Auto: Vice City]]'' has been rescaled and appears as a sign above the AmmuNation shop in Los Santos. 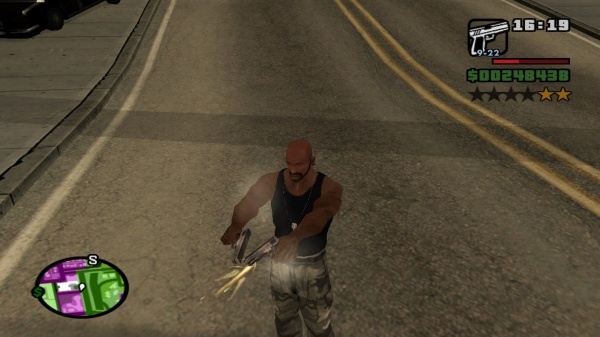 In the final mission "End of the Line", a statue of Big Smoke can be seen holding an [[Uzi]] submachine gun. 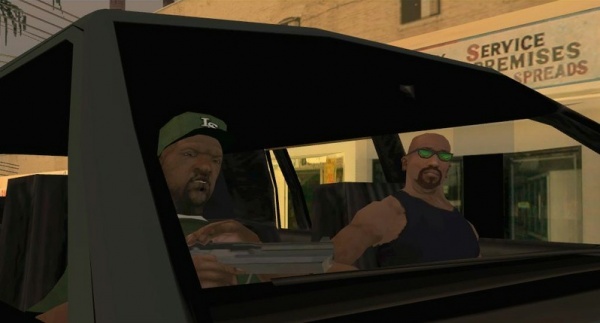 The Uzi was replaced before its release along with the early appearance for Big Smoke. During the mission Stowaway, a CIA agent is seen holding a more detailed and camouflaged [[Colt Commando]] fitted with a unfolding stock and the 20 round magazine, rather than the Model 733 used in gameplay. 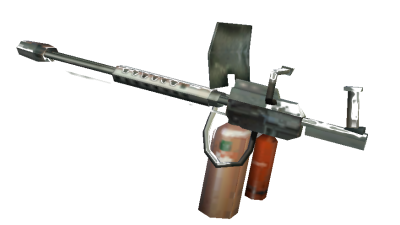 This is the same rifle model from [[Manhunt]] games, only with another texture. It is however impossible to obtain, unless the players modifies the game's files. During the mission Stowaway, a CIA agent is seen holding a more detailed and camouflaged [[Colt Commando]] fitted with an M16-style fixed stock and a 20-round magazine, rather than the Model 733 used in gameplay. This is the same rifle model from [[Manhunt]] games, only with another texture. It is however impossible to be obtained, unless the players modifies the game's files. 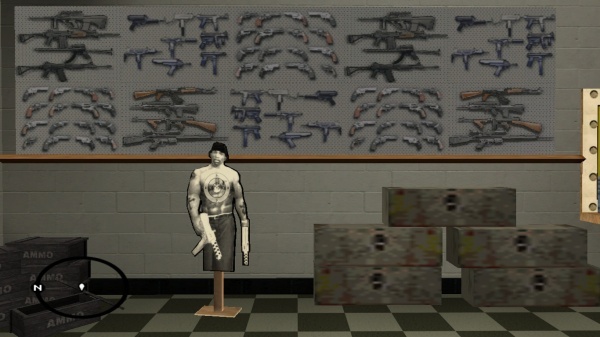 In addition to the Colt Commando, the game's files contain several other weapons from [[Manhunt]], that are not used anywhere: [https://i.imgur.com/qwZU0PK.png]. They include a double-barrel sawed-off shotgun and [[PSG-1]]. Also there is an [[MP5K]] model (not the same as in the beta of VC). It is not known exactly for what purpose these weapons were planned, whether it was to replace the existing guns, or something else. An unusable [[Browning M2HB]] is seen mounted on the rear of the "Launch", a military patrol boat. Guns on the shelves/racks in AmmuNation are: [[Steyr AUG]], [[Galil 7.62]], [[Norinco Type 64]], [[Galil AR]], various revolvers, [[Calico M110]], [[MAC-10]], [[Spectre M4]], [[Heckler & Koch MP5K]], [[IMI Uzi]], [[Calico M950]], [[Intratec TEC-9]], [[AK-47]], [[FAMAS]], [[Thompson]] and [[Heckler & Koch G3A3]]. Guns on the shelves/racks in AmmuNation are: [[Steyr AUG]], [[Galil 7.62]], [[Norinco Type 64]], [[Galil AR]], various revolvers, [[Calico M950]], [[MAC-10]], [[Spectre M4]], [[IMI Mini Uzi]], [[Heckler & Koch MP5K]], [[IMI Uzi]], [[Calico M110]], [[Intratec TEC-9]], [[Norinco Type 56]], [[FAMAS F1]], [[Thompson]] (M1921AC or M1928), and [[Heckler & Koch SR9(T)]]. This weapon was originally going to be a Glock 17, but for some reason Rockstar forgot to render it as such. However, the Glock 17 can be seen in numerous cut scenes. 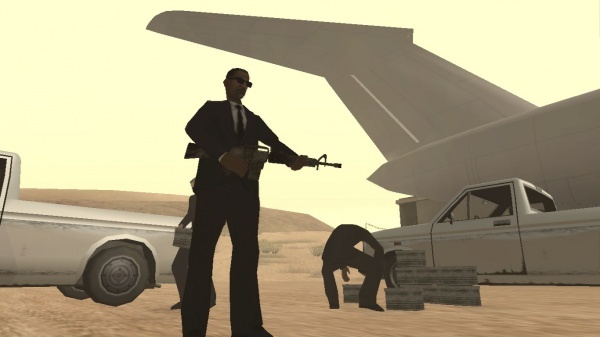 Instead they left in the old M1911A1 render from Grand Theft Auto III and Vice City. 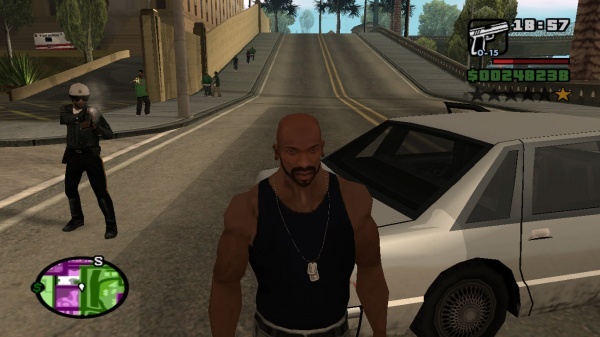 Called the "9mm" it is used by all members of the San Andreas Law Enforcement community and by many criminals in-game. Unrealistically, this weapon carries 17 rounds in a magazine (like the Glock it was supposed to be), and isn't very powerful. 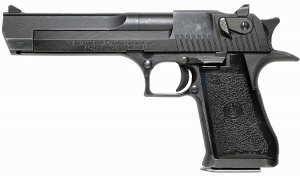 When the player reaches the "Hitman" skill level, CJ can wield two of these pistols at once (as does every AmmuNation vendor should the player decide to provoke him). 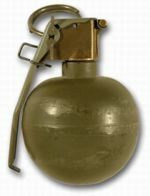 A suppressed version is also available for use in the game. It does more damage but uses a different ammunition type than the regular "9mm" and cannot be dual-wielded. 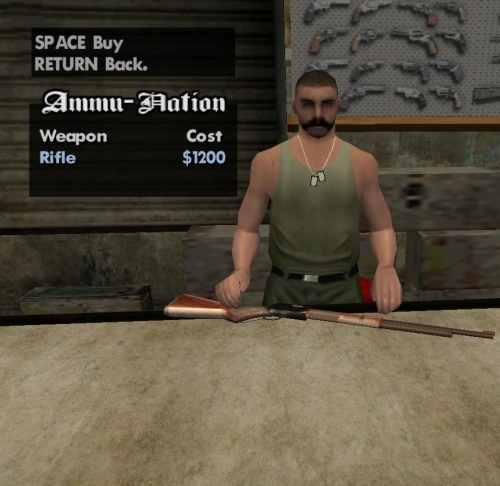 Ingame AmmuNation gun stores sell the standard M1911A1 and/or 30 rounds for $200, while the suppressed M1911A1 retails at a much pricier $600 for either the suppressed handgun and/or 30 rounds, possibly making this game title the first where a handgun's suppressor is worth more than the handgun itself. 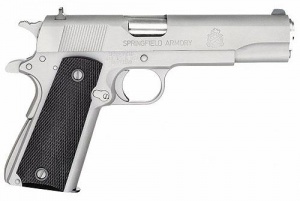 The standard M1911A1 becomes available at Ammu-Nation after the Doberman mission, while the suppressed version also requires that the Gray Imports mission be completed. The AmmuNation vendor presents a "9mm". Carl fires the pistol early in the game. At the "Hitman" skill level, he gets the opportunity to discharge dual M1911s. In contrast to most in-game characters, police officers and casino guards fire the M1911 with two hands. This is reflected at the left of this screencap, where a motorcycle cop fires at CJ, at the expense of getting shot in the back by a GSF member. The AmmuNation vendor presents a "Silenced 9mm". - "Where'd you get that?" - "Same place I buy my pants, holmes. This is America!" The Desert Eagle appears under its real name and is, fittingly, the most powerful handgun in the game, possessing a true-to-life seven round magazine capacity. 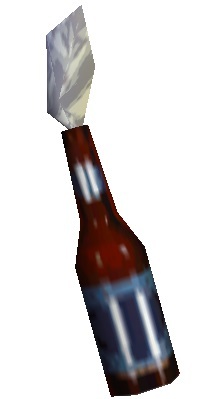 Catalina (the main antagonist of Grand Theft Auto III, who makes an appearance as a friendly but annoying character in this title) uses one in some missions given by her to CJ, and one of this game's major antagonists, Officer Eddie Pulaski (voiced by Chris Penn), carries one during the mission High Noon. 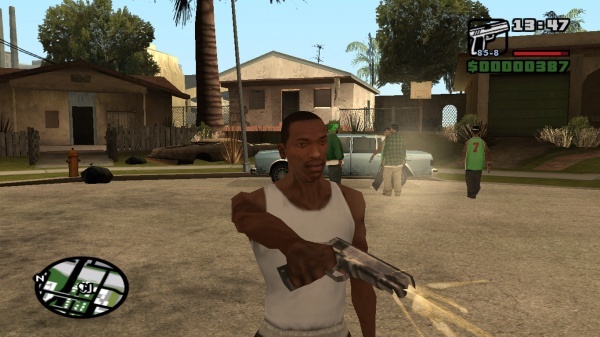 CJ is seen holding one after Officer Frank Tenpenny (voiced by Samuel L. Jackson) is killed. 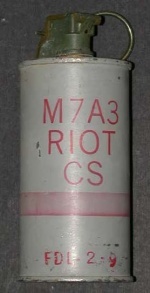 Cesar Vialpando uses one in one mission during the Los Santos riots (the ingame version of the real-life 1992 Los Angeles riots), as does CJ's brother Sweet. 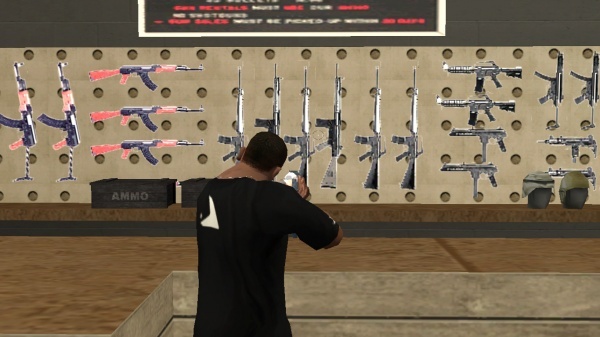 The Grove Street Families gang members can also obtain these, complete with a knife, instead of their standard M1911A1 if the player finds and sprays the Grove Street Families logo onto 100 hidden graffiti gang tags in the game world. 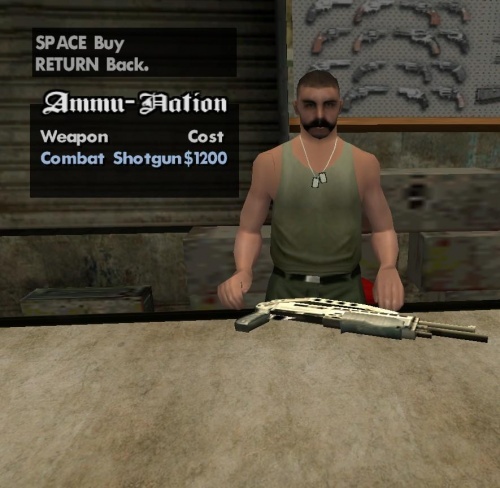 The AmmuNation vendor presents a Desert Eagle. 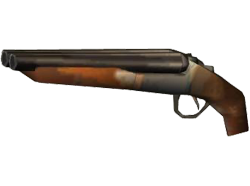 Simply called the "Shotgun" ingame, the Ithaca 37 with shorter barrel makes a return from Grand Theft Auto: Vice City and is the basic shotgun carried by some cops and many gang members and enemies in the game. CJ and Catalina each use one of these weapons during the Small Town Bank mission. The Ithaca 37's in-game model. Tenpenny holds Carl at gunpoint with a grossly undersized SPAS-12 during the final moments of the game. Note: All weapons in this category can be used one-handed in a drive-by shooting. 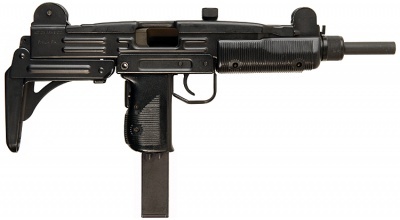 The TEC-9 and the Micro Uzi are categorized in-game as "Micro SMGs" when in reality they would be classified as machine pistols. They are treated as being generally inaccurate and relying on volume of fire to hit targets in this game. The Norinco Type 56 appears as the "AK47", with its true identity evidenced by its hooded front sight (which differs from that of the AK-47/AKM). It is uncommonly used by gang members in the game. A rusty old one is also used by CJ during a first-person rail-shooting segment in the Reuniting the Families mission. Sweet also uses it in two of the missions. Due to the fact that the Type 56 uses the same reload animation as the Colt Model 733, CJ is shown to pull a nonexistent charging handle along the top of the weapon (when in fact the handle is on the real-life weapon's right side). On a side note, the Type 56 is unrealistically depicted as being 2/3rds long as CJ is tall, and also for some reason does only slightly more damage than the ingame HK94A3, which is an SMG rather than an assault rifle. The Remington 700 is simply called "Sniper Rifle" in the game, does nearly twice as much damage as the Marlin Model 336, and has an actual sniper scope. The Remington 700 retails for a shocking base price of $5000 for the gun itself and/or 10 rounds of ammunition, making it the most expensive firearm in the game. 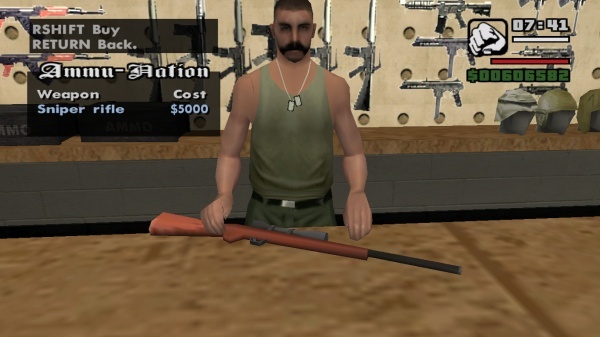 It is first given to CJ so he can cover allies with sniper fire during the mission Pier 69, and also becomes available for purchase at AmmuNation gun stores after completing that same mission. The AmmuNation vendor presents the "Sniper Rifle." In reality, a price of $6000, let alone $5000, for this rifle is a truly absurd figure given how the Remington 700 is one of the most common entry-level hunting rifles in America and often retails for less than $1000. CJ holds the rifle as if it had a pistol grip, while doing his best to ignore the Loco Syndicate member performing a one-handed straddle split behind him. Note how the HUD icon shows a Heckler & Koch PSG-1 instead of a Remington 700. CJ aims near an M134 Minigun. Carl hefts a Minigun while assaulting the massive crack palace that makes up the game's last set piece. 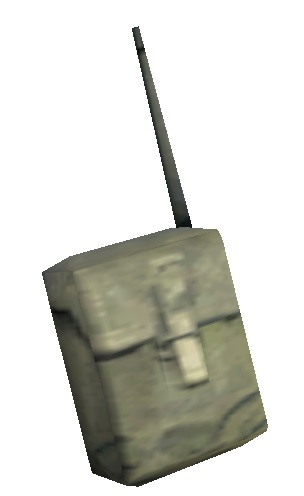 Satchel Charges are a remote-detonated explosive, and are called "Remote Explosives" in the game. When satchel charges are planted, the player gains a detonator in an additional weapon slot; by triggering the detonator, the charges explode. Satchel charges can be detonated from any distance, and with any time delay, assuming they still exist. They are first used by CJ in the Against All Odds mission. They are available for purchase at the AmmuNation after completing that mission, for a base price of $2000 each. 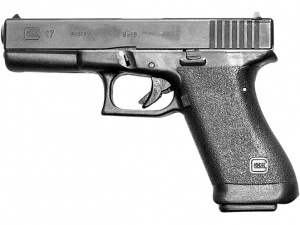 Not an in-game weapon, but the 1st generation Glock 17 is used in various cutscenes, including but not limited to the beginning cutscene of the game and the the ending cutscene of the final mission. 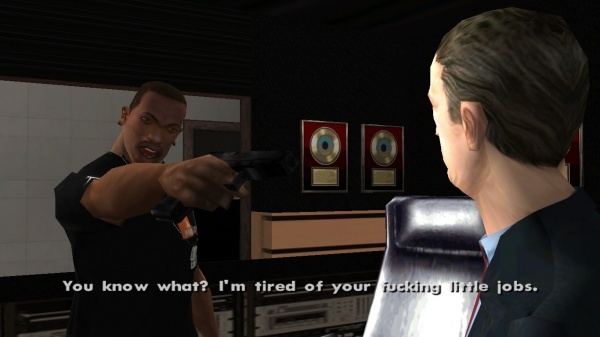 It is also seen in "The Introduction" (a short film using the game's engine, explaining what happened before CJ came back to Los Santos), where it is used by CJ himself to rob a pedestrian in Liberty City, by Salvatore Leone (Frank Vincent) to threaten Ken Rosenberg (William Fichtner), and by Officer Jimmy Hernandez to kill Officer Ralph Pendelbury on the orders of Tenpenny. While the Glock is modeled on the earlier 1st and 2nd Generation models, the texture is taken from a 3rd Generation model as the thumb reliefs are visible. A similar error is also later found in Grand Theft Auto IV where the Pistol is based on a Glock 17 with 17 rounds of 9mm ammo, but has the texture of a Glock 22. Glock 17 (3rd Generation) - 9x19mm. Much later in the game, CJ proceeds to return the favor. One of the loading screens shows Tenpenny armed with what appears to be a Springfield Armory Mil-Spec M1911A1. 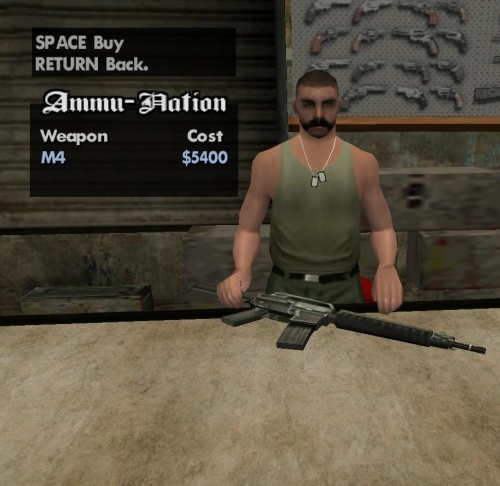 Ammu-Nation in Market, Los Santos. What appear to be short-barreled Colt Python revolvers can also be seen printed on some ammunition boxes. 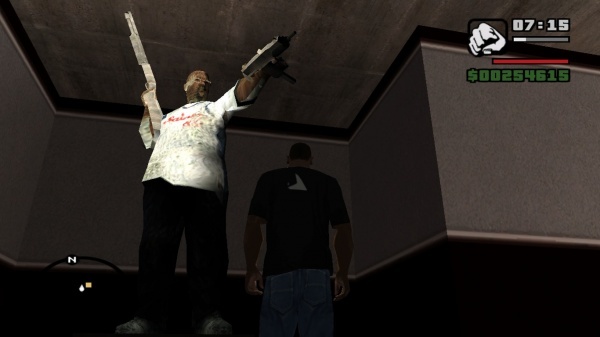 In the final mission "End of the Line", a statue of Big Smoke can be seen holding an Uzi submachine gun. 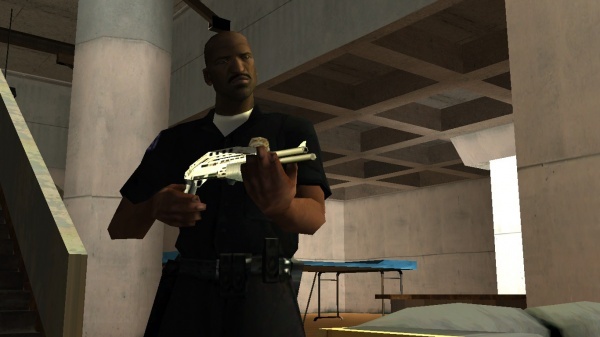 The Uzi was replaced before its release along with the early appearance for Big Smoke. Beta image of Grove St. gang members with Uzis. A statue of Big Smoke holding an Uzi along with an Ithaca 37. During the mission Stowaway, a CIA agent is seen holding a more detailed and camouflaged Colt Commando fitted with an M16-style fixed stock and a 20-round magazine, rather than the Model 733 used in gameplay. This is the same rifle model from Manhunt games, only with another texture. It is however impossible to be obtained, unless the players modifies the game's files. A secret agent with his camo Colt Commando. An unusable Browning M2HB is seen mounted on the rear of the "Launch", a military patrol boat. The M2HB in the mission "Vertical Bird". 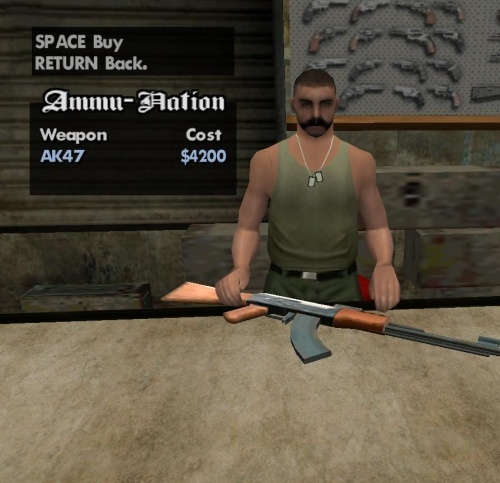 Guns on the shelves/racks in AmmuNation are: Steyr AUG, Galil 7.62, Norinco Type 64, Galil AR, various revolvers, Calico M950, MAC-10, Spectre M4, IMI Mini Uzi, Heckler & Koch MP5K, IMI Uzi, Calico M110, Intratec TEC-9, Norinco Type 56, FAMAS F1, Thompson (M1921AC or M1928), and Heckler & Koch SR9(T). Here we see additional Type 56s and Uzis, as well as the Norinco Type 56-1, Colt M16A1, Heckler & Koch G3A3, Colt Model 733 carbines without their barrels, Walther MPL, and Heckler & Koch HK94A3. 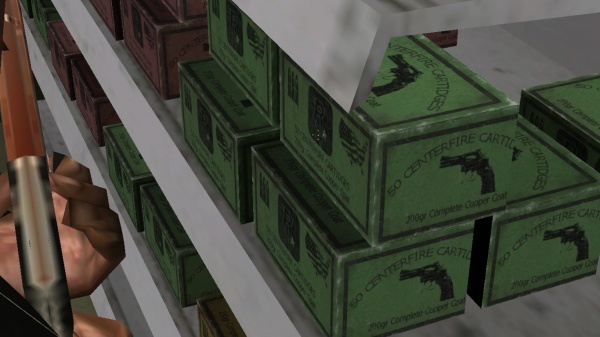 The Z-M LR 300 can be seen printed on some ammunition boxes. This is an anachronism, since the LR 300 was developed in 2000.